Our latest Be Well Workout of the Week. By Audrey McKenna Hasse·	 8/25/2014, 1:11 p.m.
For this week’s workout, you’re going to count by five all the way to 50. You’ll start by doing five pull-ups, then you’ll do 10 burpees, next you’ll do 15 reverse flys, and so on, increasing the number of reps by five until you get to the last exercise on the list—50 jumprope jumps. 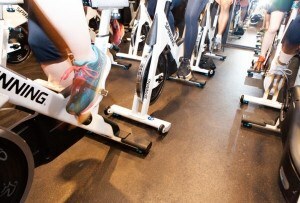 You’ll go through the circuit a total of four times, so get ready for some serious sweat, my friends. Good luck! *Repeat the circuit below four times. Pull-ups: Suspend yourself on the pull-up bar with your hands a little wider than shoulder-width apart. Pull yourself up, keeping your body as straight as possible, until your chest reaches the bar. Slowly return to the starting position and repeat. Burpee: Just like an up-down in football. Put your hands on the ground, jump your feet out behind you so you’re in push-up position, lower to the ground, bring your feet back in, and stand up. Reverse fly: Stand with feet hip-width apart and hinge forward at the waist. Holding a weight in each hand (palms facing towards each other), keep your arms slightly bent and using your back, squeeze your shoulder blades together, lifting your hands to the side. Lunge jump: Position yourself in a lunge. Jump upwards switching the front and back legs. Once landed, repeat. For more of a challenge, hold the weights you used for your reverse fly during your jumps. Sit-up: Lie on your back with feet on the floor and knees bent. Put your hands behind your ears. Without pulling on your neck and using only your abs, lift your shoulders off the mat and come to a full sit-up position. Lie back down slowly. Ski jumpers: Start in a skier’s stance (like a squat, but bent forward at the waist slightly). Using your arms for momentum, jump up and to the left, landing on both feet. Jump to the right. Repeat. 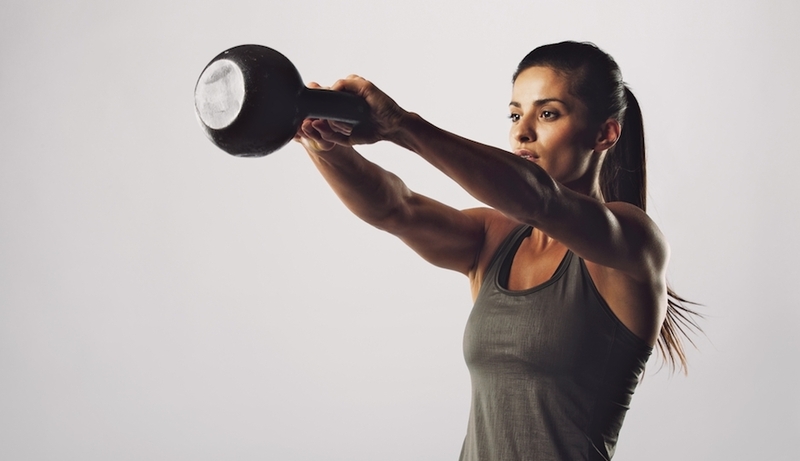 Kettlebell swings: Standing with feet about hip-width apart, hold a kettlebell in front of you both both hands. Bend your knees into a squat, swinging the kettlebell back through your legs as you drop down and forward to about shoulder height as you stand. Repeat in a fluid motion. Crunches: Get in sit-up position, with knees bent and hands behind the head. Without pulling the neck, squeeze your abs and sit halfway up. Hold for a beat, and return to starting position. Mountain climbers: Get in plank position. Alternating legs, bring your knee into the chest, keeping your upper body strong. Extend leg and switch. » Want more sweaty workouts? Check out the BeWOW archive here. Audrey McKenna Hasse is the owner of A.M.Fit, a personal training and healthy consultation business on the Main Line. You’ll find her workouts every week right here on Be Well Philly.